3 bedrooms.2.5 bathrooms. Sun filled conservatory, patio, garden. Perhaps the highlight of this house is the stylishly designed conservatory at the back. Flooded with light, it leads from both dining room and kitchen, and opens onto the patio and garden. An extra washroom here is very convenient.The sitting room with its two fireplaces and low ceilings makes for a warm welcome as you enter, and the kitchen - newly fitted - has everything you need from Italian hand painted crockery to comfortable bar stools. The master bedroom upstairs is simply dreamy. There are 2 further double bedrooms - less spacious but comfortable and beautifully decorated. Colfax and Fowler, Osborne and Little curtains decorate this cottage along with antique and new furniture alike. It is first and foremost a family home, used by the owners, but also let out for the traveller wishing to enjoy the essence of Dorset and its surrounding area. Catriona was a primary school teacher in London, before moving to Italy in 1992 on a whim, to learn Italian. She met Lorenzo, who was a student cultivating olive trees and producing olive oil. She decided to stay in Italy permanently because of Lorenzo, and never returned to live in England again. After marrying in 1996, Lorenzo and Catriona were given the opportunity to take a farm in Tuscany, which they have now been running for 15 years. Catriona lets out the holiday apartments, and Lorenzo cultivates vineyards and makes delicious organic Chianti Classico red wine. Along the way they have had three children - now in their teens - who enjoy the english side of their heritage and coming to stay when they can, in their newly acquired property near to where Catriona grew up and went to school - Pump Cottage - available here to rent. They have reliable and kind friends who take care of it in their absence and see to their guests' needs. Pump Cottage feels just as it looks. Catriona and Lorenzo fell in love with the cottage from the photos in the estate agent's. Their feelings were confirmed when they came to view it. Three months later, the cottage was theirs. Not only was the cottage itself utterly charming, but an attraction was being able to walk to the town. Set in a quiet street, and of course within the attractive confines of the grassy 'Pump Yard', you can walk just 5 minutes, and you are up on the High Street. The location is indeed such a bonus for this unique cottage. You are in a village yet you are in a town. You don't need a car to go to the shops, supermarket or cafés. You even feel as if you were in a village - charming neighbours and quietness with the lovely private garden to enjoy at the back. Then everything about the inside just grabs you as soon as you enter. The master bedroom, with windows both sides, is just perfect! It is street parking only. Fridge above. Separate freezer below. two ovens. Top - grill but also useful as small oven. Bottom - main big oven. Silver and bone handled as well as stainless steel cutlery. Bone handled knives not to be put in the dishwasher. Very good quality swiss pans and cooking knives. Italian hand-painted bespoke crockery. Heavy oak refectory table. Heat stains easily - hard mats essential. Could seat 8. The cottage is beautiful, while being comfortable and cosy. 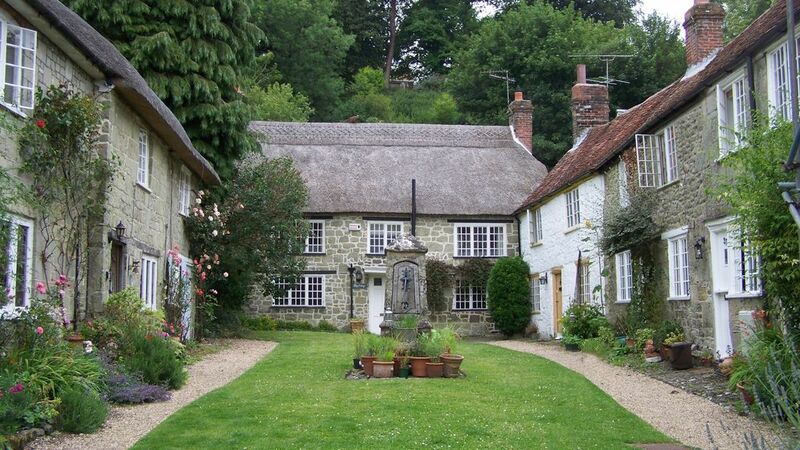 This is a great place to stay in the historic part of Shaftesbury. The hosts are great at communicating and are very flexible and thoughtful. The chianti and the honesty box was a great feature. Lovely cottage for a family to enjoy, in the lovely surroundings of Shaftsbury. A great location to explore Dorset and Wiltshire. This is a very nice cottage, with enough room for 5 with three bedrooms. It's easy to find, convenient to food, and easy walking distance to the town of Shaftsbury. This was our first trip to England and we were so lucky to have stayed in this wonderful home. The home itself was beautifully decorated, well maintained and very clean. The walls of the house are at least two feet deep at places, making it very quiet and solid. We were walking distance to the small town and a block from what I thought was the best pub in town, yet we were still in a neighborhood! I'm not used to that where I live. I could actually enjoy dinner with a pint and walk home. When we walked to the town, the view was unbelievable and there were walking trails all around. My daughter and I ran all of them; it was fantastic. We did the tour of the Shaftsbury Abbey and although I wasn't that thrilled about it doing it, I was surprised that it was so enjoyable. You really do go back in time. Catronia was so great. I felt like we were staying at a friend's home. She really took care of us and I'm grateful for everything she did for us. I would recommend this home to anyone. We really enjoyed our time in england, a large part due to Catronia's home and her hospitality.